With the start of little league baseball season and the early closing of southern New York’s ski industry, it would have been understandable if I didn’t ski this weekend. The truth is I’m not ready to give up on the season yet. My Saturday was full and, yeah, my local options were gone but I figured with a little ingenuity and determination, I could still squeeze out another ski day. That’s how I found myself jumping on the Thruway in Rockland County around 9:30 on Saturday night. Destination Whiteface, over four hours away. I drove until 1 AM, settled into an unobtrusive spot (not saying where exactly) and crawled into the back of my truck. Something woke me up before dawn and I couldn’t get back to sleep so I got back on the road. I ended up in the River Lot at 7:30, drinking coffee and twiddling my thumbs. I actually got a kick out of wandering around the deserted lodge. The gondola was scheduled to load at 8:30, but they let me on at 8:15 and I headed to the top of Little Whiteface, alone. I was nervous about the forecast, but the day started out nice, 27 degrees. There were low clouds, some fog. The visibility was decent, a pleasant surprise. 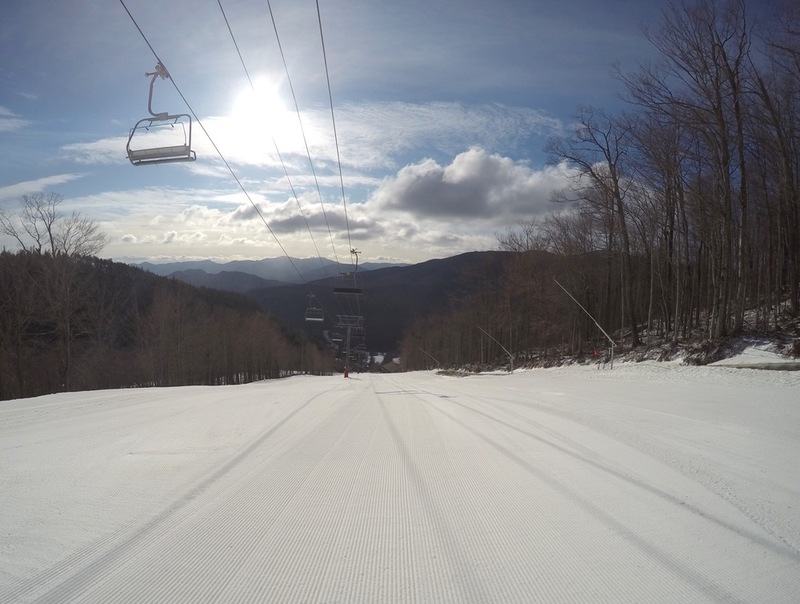 I found wall-to-wall fresh cord when I got off the lift. The groomers had done a fantastic job. Everything that was open had been resurfaced. And it was good stuff, three fingers of soft, dry corduroy. I would have preferred to have the upper mountain open but this was pretty fun too. I bombered Excelsior and then made my way back down to the base. There’s something exhilarating about just blasting down big open fields of groomed snow, especially when there’s nobody else on the trail. It made me feel like a kid. I knew skiers would be showing up eventually so I did my best to gobble it all up while I could. I moved around the mountain, checking out everything that was open. I kept skiing past the summit quad, hoping they would turn it on, but it didn’t budge all day. I rode the other lifts but kept coming back to the gondi. Without the upper mountain open, it was the most fun available to me. I took an early break mid-morning and drank some more coffee and chowed some Special K bars. When I came back it was more crowded; still no lift lines but with the limited terrain I no longer felt like I owned the place. I had pretty much destroyed the corduroy single handedly anyway so I didn’t mind having to share. Over the course of the morning, temps dropped, the wind picked up and the clouds started descending. Around noon, things were getting a little chattery; some of the snow I’d spent the morning shaving off re-froze and started chunking up. Conditions were still fun, but the teenager inside of me was aging and my legs were giving out. I took another quick break, but after I went back out, I knew was done. After a couple more slower runs, I packed it in around two in the afternoon. I took my time getting my boots off, knowing my season was almost over, and got started on the long drive home, happy to have squeezed in another ski day. 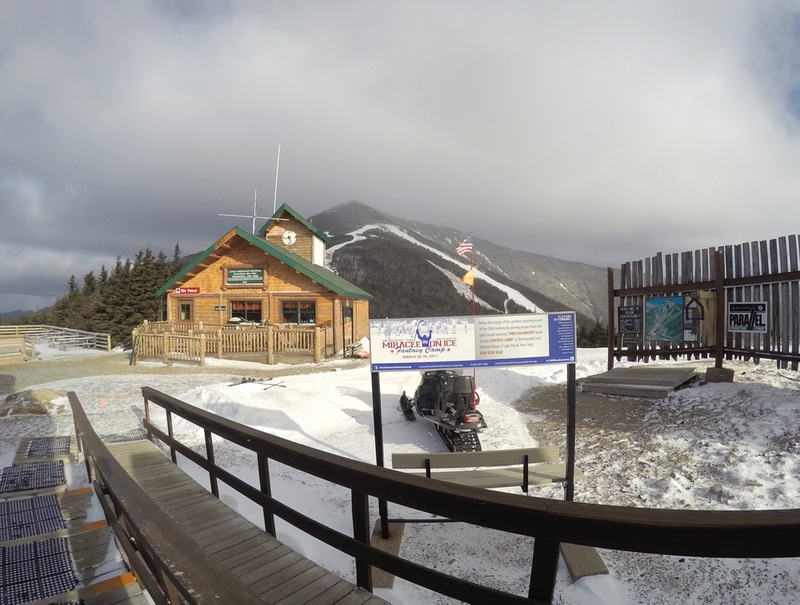 Very impressive: a Sunday day trip all the way up to Whiteface! You have a lot more teenage energy then most of us. I bet with the snow the last few days, your season is NOT over. We have not been to the Face in a long time. Arguably one of the best mountains in the East. We can relate to teenage mind but, aging bodies totally. Our kids keep us active in this household but, soon they will be out-skiing us and not want to hang out with some old slow folk. Here is to #onemoreskiday . This is great post. 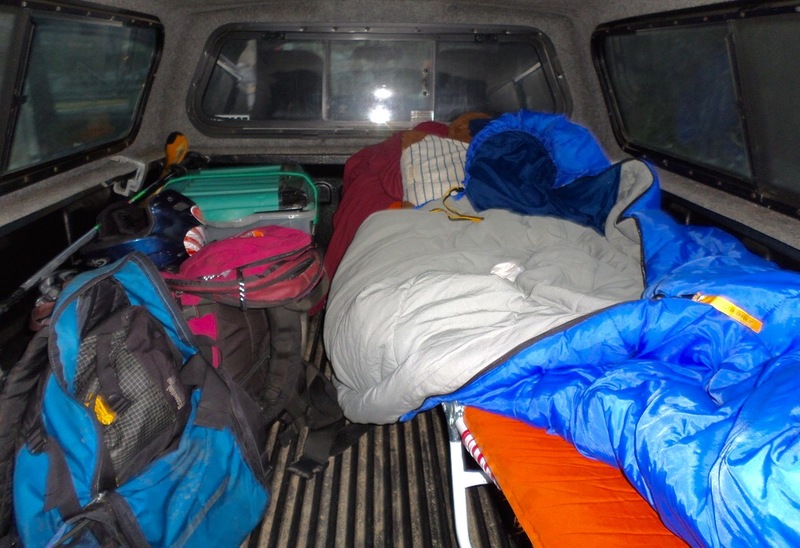 Anyone who sleeps in the back of their truck to go skiing the next day is awesome. Kind of reminds me when my brother and I camped out in the back of my dads truck at the ADK lodge before climbing Marcy the next day. Reminds me of a trip to Gore when my brother and I slept in his Uni-Cell truck in the parking lot to get first tracks. Thanks for posting. My gal and I were considering WF after skiing Twister all day. We would have done it were it not for the 8 hour drive back to Bmore. WF would have added another 90 mins. Glad you shared. For those in question: Twister was better than expected, lift attendant said 30 separate skiers/boarders at 2 pm, looked like a few more were showing up for a last run as I was leaving. Thanks for the nice comments guys. It was a fun trip. I’m glad I went. I want to be BrownSki when I grow up. For anyone in their later years with the stamina and teenage spirit thing going, keep it going. Ski and party like a rock star…like the Tom Petty lyric goes…you never slow down, you never grow old. Live by this mantra every waking day. Love to see others engage in adventures such as the one Brownski reported on. Love the Dirtbag Dad title! Ha! You guys crack me up. Reread your chic chocs story, ml. I want to be you when I grow up. Ditto Ethan Snow. One of the reasons I like my Outback is that I can, and have, slept in it. My season ended early this year, so this was a great read. I feel guilty…abandoned NYS and just kept driving North this week….any further North and I would have left the country…so I settled into a Tram ride or 8 at Jay….which was frozen hardpack, bordering on concrete. If it wasn’t for the thrill of seeing my teenage son clock past me at 62.4 mph on Jet I think it would have been better camping in my Jeep! 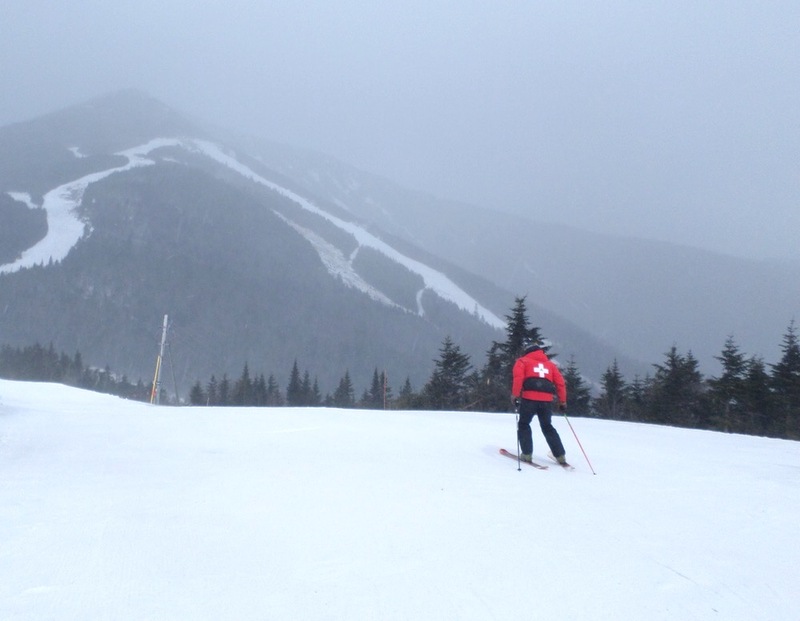 Trying hard to not let the season die at Sugarbush tomorrow….PS…they are calling for 4″ of fresh snow tonight….go figure….